Have you ever felt that too many things need doing to build a successful blog? A student I spoke to this week who recently completed our Start A Blog course said they were a little overwhelmed by how much needed to be done. They said it felt like juggling with too many balls in the air. So today I want to share a principle that has helped me keep a lot of balls in the air, and scale my business beyond what I ever thought I could manage–collaborations. When you’re juggling alone you can only keep so many balls in the air. (The current record is 9 balls for 55 seconds.) But if you juggle with other people, you can keep more balls in the air for longer. And this podcast is all about how you can make your blogging a more collaborative experience. Creating Products Week: Which Product Should I Create? Hi there and welcome to episode 237 of the ProBlogger podcast. My name is Darren Rowse and I’m the blogger behind problogger.com, a blog, podcast, event, job board, series of ebooks, and courses designed to help you to start and have an amazing blog that’s going to change the world in some way, that’s going to change the lives of your audience but also build a profit, and in doing so, change your life a little way as well. You can learn more about ProBlogger over at problogger.com. Of course, check out our two brand new courses. Firstly, our Ultimate Guide to Starting a Blog which was released earlier this year, and our soon to be released, 31 Days to Build a Better Blog. You can find the Start a Blog course at problogger.com/startablog and you can sign up to be notified when our 31 Days to Build a Better Blog course goes live at problogger.com/31days. In today’s episode, I want to talk about collaborations as a way to grow your blog, to accelerate the growth of your blog. I want to give you some practical ways that you can collaborate with other bloggers to grow you traffic, to create content, to build engagement on your blogs, and to monetize your blog. Collaborations have helped me incredibly to grow my blog, to scale it so much faster than I could’ve ever done alone, and I want to help you to do the same. You can find today’s show notes at problogger.com/podcast/237. Have you ever felt that there’s just too many things that need to be done to build your blog to make it successful? This week, I was speaking to one of the students who’ve recently completed our a Start a Blog course and they said to me that they felt like they were completely overwhelmed by how much needed to be done. The words they used were they felt like it was a juggle and that they had too many balls in the air at once. This is a feeling that I can relate too and I’m sure many of you can relate too as well because there’s so many things that need to be done to build a successful blog. You need to write content, edit that content, polish that content, and schedule that content. You need to promote that content, drive some traffic to your blog, engage on social media, set up an email list. Then when the traffic comes, you’ve got to moderate the comments and engage with the audience, there’s email lists, there’s blog design, there’s servers, there’s plugins, and WordPress that needs to be updated, then there’s the monetization and finding the advertisers, all the affiliate products that you’re going to promote or creating the products that you’re going to sell, and then learning how to sell them, maintaining shopping carts, and the list goes on, and on. I hope I haven’t just made you feel stressed. This is something that we all feel from time to time. It’s a common feeling. Most of us feel like we just can’t get it all done. There’s a number of solutions to this. One, we can get more effective with our time and certainly productivity is something that we teach about at ProBlogger. In fact, if you want to go back and listen to episodes 40 and 163, I’ll give you some practical tips on how to be more effective with your time. But today I want to share a principle that helps me to keep a lot of balls in the air and to scale my business beyond what I’ve ever thought I’d be able to manage in the early days by myself. Today I want to talk about collaborations. Here’s the thing when you’re juggling balls for example. There’s only so many balls you can literally keep in the air at once. I actually just look up the world record for how many balls can you keep in the air at once and the world record is nine balls for a single person to juggle for 55 seconds and there’s a video as well of it, it’s pretty cool. 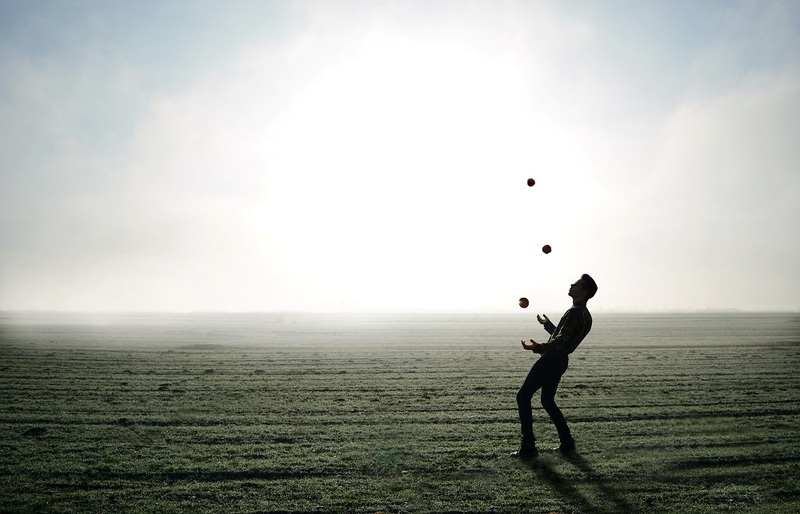 You can only juggle so many balls at once, there’s a ceiling to that number but when you juggle with other people you can keep more balls in the air at once and for longer. It’s just logic really. Two people juggling nine balls each, that’s 18 balls and if you’re juggling together, potentially, you could even increase that number. One of the things that I want to encourage you to do if you’re feeling like you just can’t get it all done, is to consider how you might want to make your blogging more of a collaborative experience. How can you involve others in the experience of blogging? There’s a number of ways to do this and the most obvious one is to hire people to help you. New team members, or to outsource tasks. That’s certainly one option but I know for many of you listening to this, it’s not realistic at this point in your blogging journey. Maybe you don’t have any money to invest into that, you might not have that sort of budget. For the purposes of this podcast, I don’t want to talk about hiring or outsourcing, that’s probably a topic for another episode. In this podcast, I want to talk about collaborations with bloggers or other online entrepreneurs where you find a win-win opportunity to work with each other, where one person isn’t paying another person to work for them but you’re finding a win-win solution where you both can benefit from doing something together. It’s a true collaboration. In my experience of blogging, there’s so many ways you can do this to grow your blog and the other person’s blog. The key is to write from the outset, to look for a win-win, to look for something where you are going to benefit. Your blog will grow in some way, the other person’s blog will grow in some way, and their business will grow in some way as well. You both make the same thing out of it, you both make a traffic out of it all, you both make a content out of it all, or you both make monetization out of it all. In some situations, it may be that one person gets traffic and the other person gets content or vice versa. There’s a variety of different ways you can collaborate. In this episode what I want to do is run through four main areas that you might want to consider collaborating on and they’re all tied around the pillars of ProBlogging that we talk about quite regularly on ProBlogger. If you’ve been listening for a while, you’ll know that I advise all the time that you really should be putting most of your efforts into four things. Firstly, creating content for your blog. Secondly, building engagement with your readers, building community with your readers. Thirdly, driving traffic to your blog, promoting your blog. Fourthly, monetizing your blog. If you want to build a profitable blog, they’re the foundational of things you should be spending most of your time in. Content, engagement, traffic, and monetization. There’s other things that you should be doing as well but that’s probably where 90% of your time should be going into. In my experience, you can collaborate in each of these four areas and some of you will have a real strength in two or three of them and you may have some weaknesses in another one. One way that you can supplement some of your weaknesses and boost one of those other areas is to find collaborations. What I want to do is to look at each one in turn and suggest one or two things that you could be doing in each of those areas to collaborate. Firstly, let’s look at content. There’s a variety of way that bloggers could collaborate with one another when it comes to content. Firstly, and perhaps obviously, is we allow each other to create guest content for our blogs. This is very normal, it’s very common and it’s been going on for years. I’ll write you a blog post, you write me a blog post or I’ll just write you one and you post it. There’s a variety of ways that you can kind of structure those kind of agreements, it might be we exchange posts for each other’s blogs or maybe one person just writes for the other. The idea here is that one person gets content and the other person get some traffic or some exposure to build their profile. This is very common and this is perhaps the easiest way that you might want to collaborate in this, but there’s so many other ways that you could collaborate when it comes to content. As I look at YouTube, I think we can learn a lot from them. YouTubers collaborate all the time. In fact, if you go to YouTube you can actually find a whole page that YouTube has created themselves to try and foster collaborations because they see it in their best interest if they get their users collaborating together. It’s very common for one YouTuber to appear on another YouTubers channel and they create a piece of content together. Sometimes the piece of content will then go and appear on both of the channels. It’s just normal, they do it all the time and they do it very, very well. It struck me that this kind of collaboration where we create content together could happen on blogs too. It may be slightly more tricky with written words. We might think, “Well, I can’t write an article with another blogger,” but you actually can. In writing books, co-authorship happens all the time. The ProBlogger book is a co-authored book, it’s Chris Garrett and myself writing different parts of the book. We’ve seen mainstream media. Articles get written all the time that are collaborations and the by line is two people’s names there. People work together as writers, why don’t we do it more as bloggers? I’ve got 20,000 posts that I’ve published on my blogs over the last 14 years. I didn’t write them all but of those 20,000 posts, I would say 98% of them are one person writing the post. It’s probably more like 99%. There’s two main exceptions to that. Firstly, interviews would be the main exception to that and this is a relatively easy way to collaborate on a piece of content where one person interviews another and this is where I’d be starting out if you want to go beyond this post, I would be interviewing another blogger and then getting them to interview you and have those pieces of content go up on the blog. That’s a really easy way to collaborate on a piece of content. You could actually write the post together. I can think of two occasions where I’ve done this and I’ve published a post on ProBlogger back in 2004 and I’ll link to the post in today’s show notes so you can see them. In both of these posts, it was part of a series that I was doing on ProBlogger and the posts were written with a guy called Shayne Tilley who many of you will be familiar with. He speaks at our events almost every year and he’s written a number of articles on ProBlogger. In these two posts, I actually asked Shayne to tackle a topic but I also realized I had some things to say about that topic as well. If you go and have a look at the post, and I encourage you to do it, you’ll see that he’s written the post but from time to time there’s this little section that says, “Darren says,” and it’s got my head in it. It’s my little face and it’s in italic so it looks slightly different. We’ve got these call out boxes, almost looks like a block quote type thing around it. Shayne writes his and his head is there and it says something like, “Shayne says,” and then it says, “Darren says,” and it’s almost like a conversation. It’s not an actual interview. he had written his article and then I chimed in with my comments along the way. This post really went over well. Our readers really enjoyed that back and forth on this topic. It’s just one way that you might want to do a post with someone else, a collaboration in that written form. There’s so many other ways that you can do it. You could run a series of blog posts across two blogs. I have the first post on my blog, you have the second post on your blog, and then we interlink them. Sending traffic back and forth and collaborating that way, we could do a blog take over. I’ve done this in the past on ProBlogger where I’ve taken a vacation and another blogger I think, Bryan Clark from Copyblogger came on in the early days of ProBlogger and he did a whole week of content on ProBlogger. You could do that type of collaboration as well. Think creatively about it. There’s so many different ways that you could collaborate with another blogger in your niche. That’s the first pillar, creating content. The second pillar was growing engagement or building community. When it comes to doing that, I reckon there would be a lot of different ways that we could collaborate as bloggers together. For example, why does every blogger have to have their own Facebook group or their own Facebook page? What if a few small bloggers got together and they were from the same niche and decided to have a Facebook group together that they co-ran? You’d want to choose carefully the type of person that you wanted to work with, you wanted to have some trust with that person, I’ll talk more about building that trust later but why not do that? You may not have a big enough audience to really keep a Facebook Group running but what if two or three other bloggers in your niche decided to do it with you? Together, you probably would have enough people and it’s a way of exposing each of you to each other’s audiences and to build some engagement that could go deeper and beyond what anyone of you could do individually. Similarly, you could run a Twitter chat together. Some bloggers actually do this, they agree on a hashtag and they decide that each of them is going to promote this hashtag, and once a week they do a Twitter chat where they get all their readers together to have a chat. Live video will be another way of doing it. You could do some live videos and share them to all of your different Facebook pages, or all of your different Facebook groups, and introduce each other’s audiences to one another. Engagement, building that sort of back and forth is something that you could do together. In fact it may actually be easier to do, particularly if you’re just starting out, if you do it together. Third pillar was driving traffic. The same thing is true when it comes to doing that. We all share our own content on social media and emails each week. Why not partner up with another blogger and agree to share some of theirs if they share some of yours? I’ve done this a number of times over the years with other bloggers. For example, when I was just starting Digital Photography School, there was another photography blog that was on a slightly different topic to mine. It had a slightly different focus but we realized our audiences did overlap. We decided that five times a week, once a day, we would share a post that the other one had written that day on our social media accounts. It was very simple, we just had this little Skype conversation open all the time. Every time we publish a new post, we just left the link in the Skype conversation and then every day when we’re scheduling our social media, we went to the Skype conversation and grab the other persons link and added it into our social media channels. Once a month, we decided that we were going to promote each other’s content, one piece of content in an email newsletter. We each got to choose one of our posts that we thought would work best for the other person to link to in their newsletter. As a result of just doing that, both of our blogs grew faster and we accelerated the growth of our blog. There’d be so many different ways to do that. That was just me working with one other blogger, I’ve seen bloggers do this in little groups and they set up a Facebook group and they do this sort of sharing type thing. There’s a lot of different ways that you could do this. The last pillar that I want to talk about is monetization and for me this has been the biggest area of collaboration. I guess this started way, way back when I began to do affiliate promotions of other bloggers’ products. I remember the first time I actually did, I saw this other blogger in the photography space, had created an ebook. I’ve never really seen another blogger do an ebook before and then I noticed that it had this thing called an affiliate program to promote the ebook. They said that I could promote it and anyone could promote that ebook and earn 50% commission. I think it was like a $15 ebook and I was like, “Wow, $7.50 per sale,” I wonder what I could do in terms of sales. I signed up for their program. I didn’t contact the blogger at all. I just signed up for their program and I grabbed the affiliate link, and that night I sent out an email to my little photography list. By sending out that email, I made a few hundred dollars over night and I was like, “Cool! That’s pretty cool,” that was just one email and for me that was a pretty big deal at that time. I decided a few weeks later to contact that blogger directly because I noticed they had a number of different ebooks. I approached him, I didn’t really know what I was doing, I didn’t know whether it was a dumb thing to approach people directly but I approach the blogger and I said, “Would you be interested in giving my readers a discount on one of your ebooks?” He didn’t really know whether that was a dumb thing either, this was all new to both of us but we decided to give it a go. He’d seen the sales come through from my previous promotion and he said, “Yeah, I’ll give you 30% off for your readers for a week.” We did this week long promotion on another one of his ebooks and a few months later my email list was slowly growing, and growing, and growing and it was the first time I’ve done anything like this. I sent out an email and it went crazy because there was a discount this time. Over the coming weeks, I think we made about $5000 in sales as this promotion ran and that promotion did a few things. Firstly, it cemented a relationship with this blogger and we continued to work together for a few years after that. We’re semi-regularly promoting each other’s ebooks. Once I created some ebooks he became an affiliate for me as well. It became a really mutual relationship where we promoted each other’s stuff, where we made quite a bit of money together. The other thing that I learned by doing that little collaboration was that ebooks worked with my audience and so I decided to create my first ebook. I began the painstaking process of writing my first photography ebook. For me, it took me three or four months to get that ebook written, it was a lot of work. I got there in the end though. I think I tell the story of the creation of that ebook in episode 67 and back in that episode you might remember that ebook actually did really well with our audience. We made about $72000 over the 10 days after that launch. It was a really good payoff for all that work. But I got to the end of that launch and I knew I needed to do more products of my own but I just didn’t have the time. This bring me back to collaboration again. Creating ebooks was another ball that I had to put in the air but I was already at capacity, I was already juggling my nine balls, I didn’t know how to add a tenth into that scenario. I decided the only way I could do it to create a second ebook was to find a collaborator. I reached out to one of the people who’d been writing some articles on my blog and we started talking about maybe instead of writing some articles for me, they could write an ebook for us and we decided to create this ebook together. He’s had a collaboration work, he wrote it, he did all the work, and I’m writing it which was a lot of work but I worked on the design, the marketing, I had the traffic, I had the email list, and he didn’t have any audience. I worked on promoting it and marketing it. Getting a shopping cart up, doing the customer service, and drove a lot of traffic to it, and we decided that we were going to split the profits on that. That ebook did a lot better than the first one and it began a snowball effect in many ways. That collaborator went on to write three more ebooks. We ended up with four ebooks with him and then he also created a series of courses with us as well. It became an ongoing relationship that we had and as a result we made a fair bit of money for him and he made a fair bit of money for us as well. Today we’ve published I think it’s around 30 ebooks. All of them, except for the very first one, are collaborations. I’ve not written a single ebook on Digital Photography School since the very first one. In fact that first one no longer is available for sale, it’s been superseded. We’ve created six courses, all of them are collaborations. We’ve created some softwares, some Lightroom presets, all of them are collaborations. As I look at my income streams, 90% of them are collaborations. The only real exception in all of my income streams that’s not a collaboration is the job board on ProBlogger and perhaps the event that we run for ProBlogger as well although even that you could probably argue as a collaboration of sorts because we work with a variety of speakers who speak at out events as well. Ninety-percent of my income streams, even the ad networks, that’s a collaboration. I’m partnering with AdSense, we sell ads directly to sponsors. I guess you could say that’s a collaboration because the sponsor is working with us but we actually outsource the process of selling those ads as well to a third party who takes a cut of those ads as well so that’s a collaboration too. Everything I do is collaborations when it comes to income and as I’ve been preparing this podcast, I guess really come home to me just how important collaborations have been for me. How do you develop these collaborations I guess is the big question. The thing I want to say is that, yes, today 90% of my income comes from collaborations but it started really small. It started because that guy who wrote that first ebook with us, he started as a writer on our site and that was the small collaboration. He started writing some guest posts for us and we sent him a little bit of traffic, and helped build his profile, and he created some content for us, and that’s where it began. The first thing I would really encourage you to do is to think about how you can start small. You may not want to leap into writing a book together as your starting point. Start with them writing a piece of content for you or you writing a piece of content for them, or start with, “Let’s promote each other’s content once a week,” and let that relationship grow, let that trust grow, see if you work well together. Do small things and let the great relationship grow naturally over time. When I first had that guy write on my blog for the very first time, I didn’t know it was going to turn into an ebook deal, then courses, and an ongoing thing. I didn’t realize the nature of that relationship, I just started with something small. When you’re looking for collaborators, look for people who have complementary skills sets to you. You don’t want to just duplicate it, you don’t want to just choose someone who’s exactly like you because then you’ll end up just doing the same things. As you look at your own skill set, maybe there’s a deficiency, maybe you’re not as good on design, or maybe you’re not as good at promotion and marketing. Find other people who can complement those things and fill in those gaps that you have. Look for collaborators who share your audience or at least complement your audience. You don’t have to have a blog on exactly the same topic but there needs to be enough overlap, particularly if you’re going to drive traffic in the collaboration, there’s overlap there. You don’t want to be a fashion blogger, and if they’re a travel blogger, and you’ve got completely different audiences. You might work well together if they’re a fashion blogger, and you’re a travel blogger, and you share the same demographic of audience but if you’re talking to retirees who are 70 and they’re talking to millennials, it’s probably not going to work at least in terms of sharing traffic and building engagement in that way. Look for collaborators who share your values. I can’t stress this enough. The few times that I’ve run into issues over the years with collaborations, it usually came down to us having different expectations of the relationship, different motivations, and ultimately some different values as well. You want to choose good people, people of character, people who share your values, your goals, and expectations as well. As part of this, you want to make sure you set the boundaries of the relationship early. Get the expectations right. If it’s going beyond, “Hey, I’m going to write a piece of content for you, and you write a piece of content for me,” if you’re getting into, “We’re going to create a product together,” you want to get that in writing and know right up front how that is going to operate. There’s a variety of models there in terms of sharing revenue. You may do a collaboration where one person takes a higher percentage of profit or revenue based upon them bringing more to that relationship. It doesn’t always have to be 50-50 but you want to be really clear up front about how the benefits, the wins from that collaborations are going to be split up. Lastly, communicate. It’s just so important to keep the avenues of communication open in these collaborations at all times. I’ll just stress again, start small, you don’t have to leap into a massive collaboration with someone that you barely know. You want to build trust. Let that relationship grow naturally and who knows where it might end up. I hope that’s helpful. I would love to hear your stories of collaboration. I know many of you have collaborated in ways that I haven’t mentioned in this particular podcast and so I’d love to hear how you collaborate. Maybe we could do a follow up podcast at some stage with some of the things that you advice. You can let us know how you collaborate, any ideas that you’ve got on this topic in two ways. Firstly, on our show notes where there’s an opportunity to comment at problogger.com/podcast/237 or in our Facebook group. You can let us know there any tips that you’ve got. If you are sharing a tip, just make sure you use the appropriate hashtag there. We like everyone to hashtag every post that they’ve got. If you’ve got some advice, hashtag it with that and if you’ve got a question to ask as well, make sure you do that. There’s information in our pinned post about how to hashtag your posts. Thank you so much for listening today. I’m actually going to be on the road next week, there may not be a podcast coming out on next Monday because I will be in San Diego at Social Media Marketing World where I’ll be doing a talk. Part of my talk is actually about this very topic. If you’re in San Diego, I’d love to catch up with you at Social Media Marketing World. Otherwise, I’ll be back on the podcast in a couple of weeks’ time with episode 238. Thanks for listening, chat with you next time. If you are looking for something else to listen to, I did mention a few episodes during this particular episode. Episode 40 was 7 Productivity tips for Bloggers, episode 163 was another 3 Different Tips for Increasing your Productivity, and episode 67 was How To Create A Product For Your Blog where I tell the story of my first product and give you some suggestions on creating products for your own. Dig around in the archives, there’s 236 other episodes to find there. You might want to go back through iTunes. They’re all sitting there, at least they will be for the next little while. I think 300 is the limit. Some of those early episodes will begin to disappear once we get up to the 300 episode mark. Thanks for listening. If you’ve got a moment as well in iTunes or whatever podcast app you are listening to, I would love it if you’d leave us a review and rating. I do read them all, I get a notification every week every time a new one comes in. Let us know what your name is in that as well and if you want to pop in your blog link, it doesn’t come up as a hyperlink but I do check out the links of all blogs that are mentioned there as well. Thanks for listening, chat with you next time. The post 237: How Collaborations Can Accelerate Your Blog’s Growth appeared first on ProBlogger.